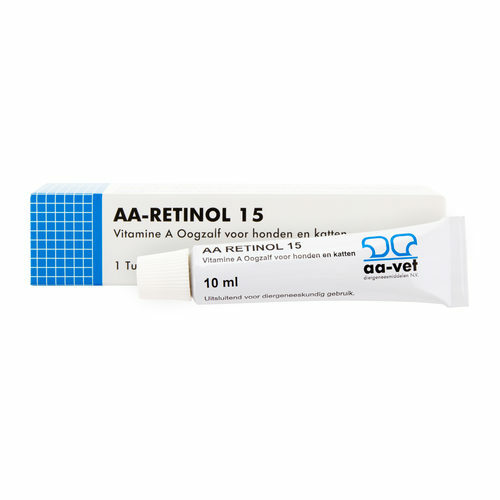 AA-Retinol is an eye cream for dogs and cats. This is a soft, almost liquid cream that can be used to care for the cornea and retina of your dog or cat. AA-Retinol is a soft eye cream that you can apply to the surface of the eye of your dog or cat. It contains vitamine A, which is important for the growth of cells in the cornea and retina and cares for the eyes. Before applying the cream, first clean your pet's eyes. You can use cooled boiled water, but also an eye cleaner, such as Ophta-Clean. Then softly push the skin below the lower eyelid down to create space between the eye and the eyelid. You can now apply the cream to the edge of the bottom eyelid. Be careful not to touch the eye or eyelashes. Finally, softly massage the closed eye-zone to distribute the cream. Apply two to three times a day. Store the tube in a dry place below 25 degrees Celsius. Do not store in a fridge or freezer. Store the eye cream in an upright position, with the cap to the top. After opening, the cream can be kept for 14 days. Retinolpalminate 15.000 I.E. (Vitamin A). Have you used AA-Retinol 15 Eye Cream before? Let us know what you think about this product.